We offer a wide assortment of medieval coins for your purchasing pleasure; given the nature of a new monarch to sometimes re-mint currency to feature their own likeness or the tendency to re-mind currency to honor a certain monarch during or after their lifetime our medieval coins feature a variety of kings and images as well as coming in a variety of denominations that were used throughout medieval Europe. 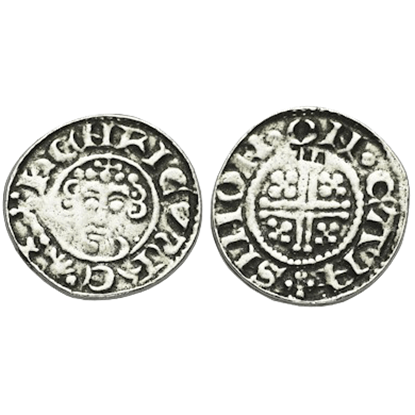 While featuring primarily English kings and English medieval coins, this category contains nearly all of our medieval coins that do not find direct usage during any of the other named eras. 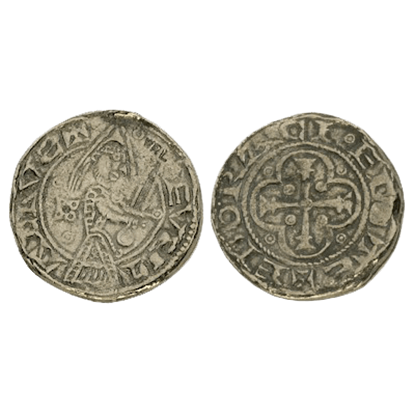 Our Medieval coins are great collectors items and even as gifts to children, collectors, or gamers; they can even be used as a fake currency during re-enactments and fairs. 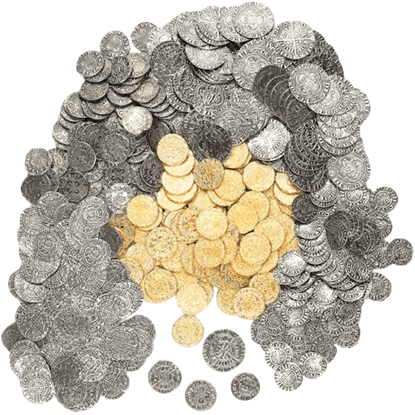 This Set of Medieval Coins is a mix of 10 lots of 5 different reproduction coins, including pennies, half-groats, groats,0 and gold quarter nobles. All our coins are made from pewter that is either antiqued or gold plated. 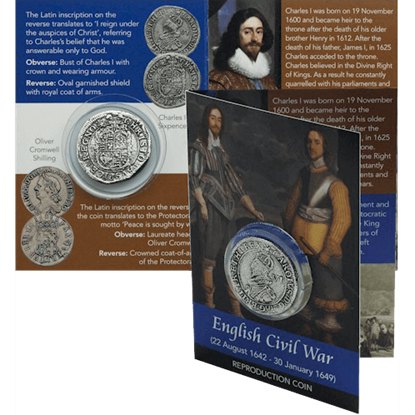 This Charles I Civil War Coin Pack is a historic collectible that contains not only a bit of information about the civil wars in England, but also includes a realistic, metal replica of one of the coins used during Charles I rule. This reproduction coin looks like it was newly minted, just like the coins of the English Civil War would have looked all those years ago. The Charles I Half Crown Replica Coins pack includes ten amazingly authentic British coins. This reproduction coin looks like it was newly minted, just like the coins of the English Civil War would have looked all those years ago. 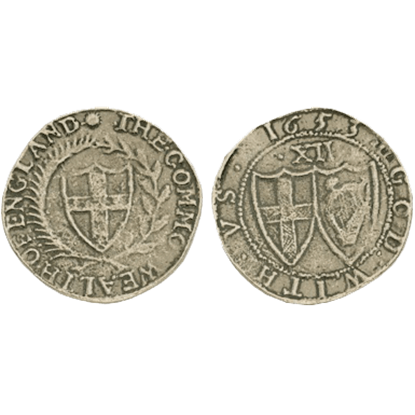 The Charles I Tower Min Sixpence Replica Coin pack includes ten authentic looking coins. This reproduction coin looks like it was newly minted, just like the coins of the English Civil War would have looked all those years ago. The Commonwealth Shilling Replica Coins pack includes ten authentic looking British coins. 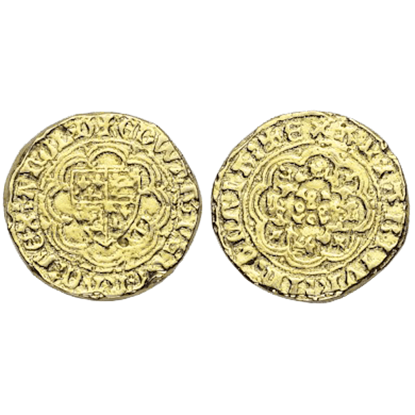 This is a reproduction Quarter Noble coin of Edward III with shield within tressure of arcs on the obverse and florinated cross within tressure of arcs on the reverse. 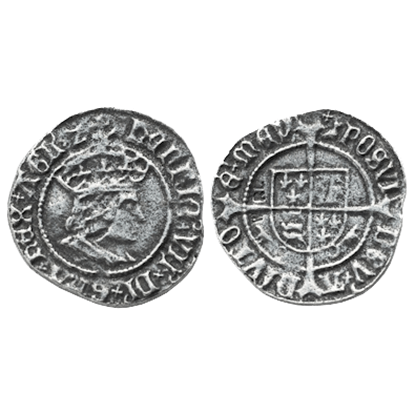 Our Edward III Quarter Coin is made from lead-free pewter. This reproduction coin depicts Eustace in full armour holding sword on the obverse and a cross in a quatrefoil on the reverse. These Saxon and Norman Coins are great for kids of all ages, collectors, gamers, and living history groups. Many kings and queens minted coins in their image, and George III was no different. 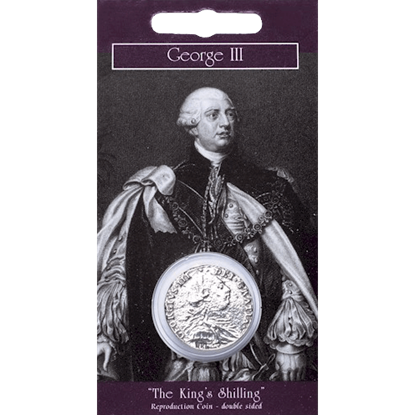 This George III Replica Coin Pack is a reproduction of his shilling, contained in a blister package with an informational card that describes the coin. The Battle of Agincourt is one of the most significant in English history, as it marked a major turn in the Hundred Years War against France and legitimized the use of the longbow. 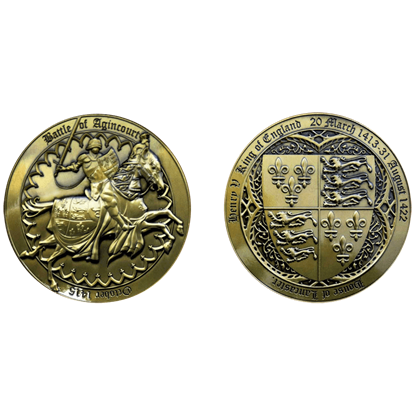 Commemorate this iconic battle with the Henry V Coin. 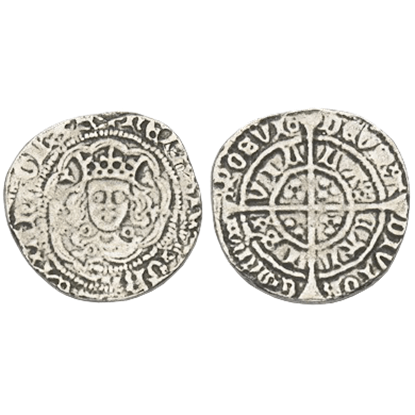 This is a reproduction Halfgroat coin with Henry VI facing on the obverse and long cross with three pellets in each angle on the reverse. 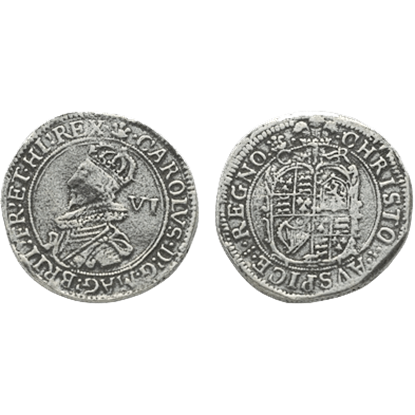 Our Henry VI Halfgroat Coins is made from lead-free pewter and comes in a package of 10 coins. 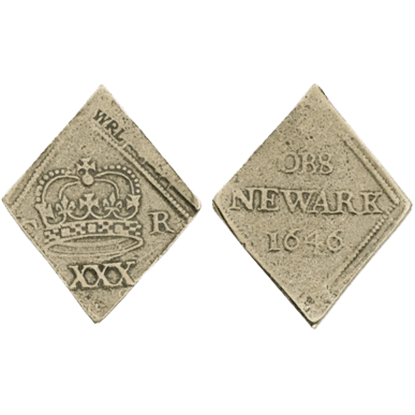 This reproduction King John Penny Coins feature the square faced portrait of King John on the obverse and short cross on the reverse. These medieval coins are made from pewter that is antiqued plated and comes in a package of 10 coins.